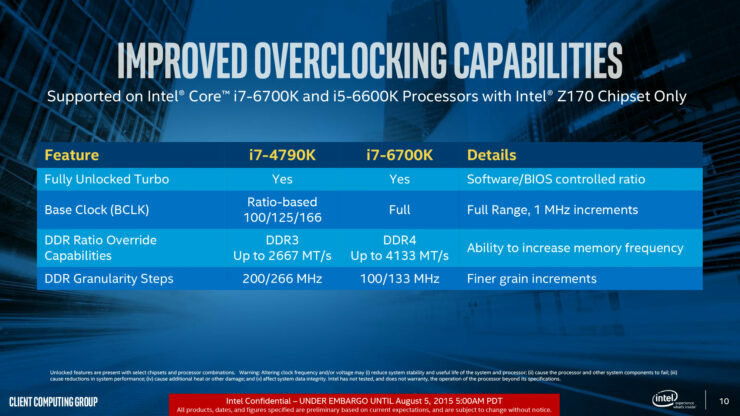 The day has finally arrived when Intel launches their latest, 14nm based, Skylake processor family which are going to include their 6th generation Core i7-6700K and Core i5-6600K processors. 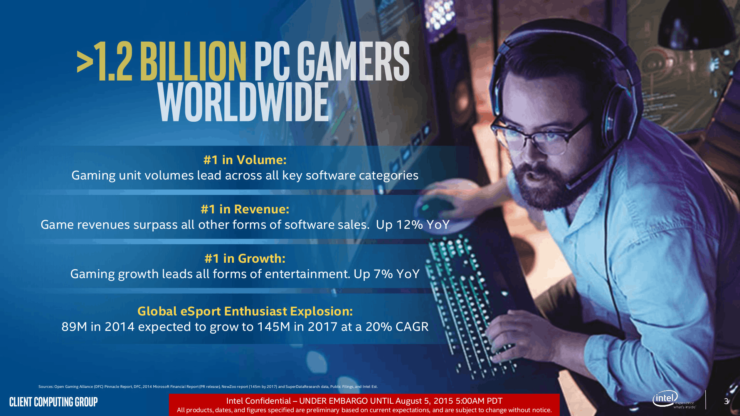 The new processors will feature improved performance, better overclocking capabilities with fully unlocked designs and will feature support on Intel’s Z170 chipset based motherboard which makes them the first mainstream platform to have full DDR4 memory support. 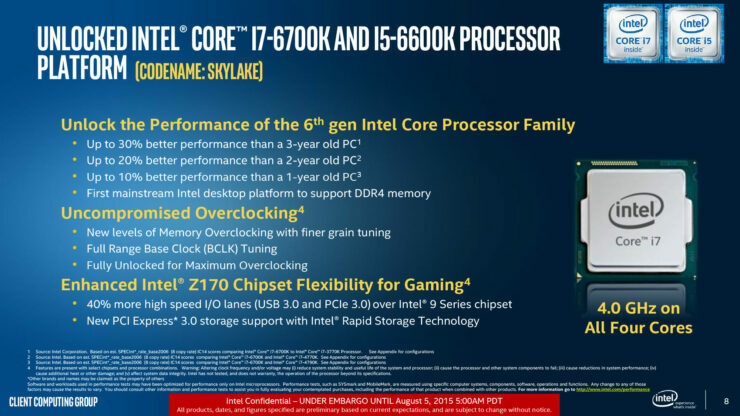 The Intel Skylake-K family is the name of SKUs that include the unlocked Skylake processors. 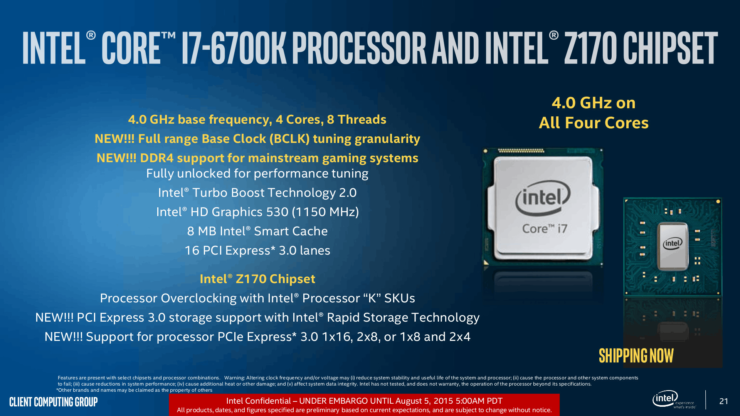 These processors include the Core i7-6700K and Core i5-6600K which are launching today and will form the high-end section of the Z170 platform. 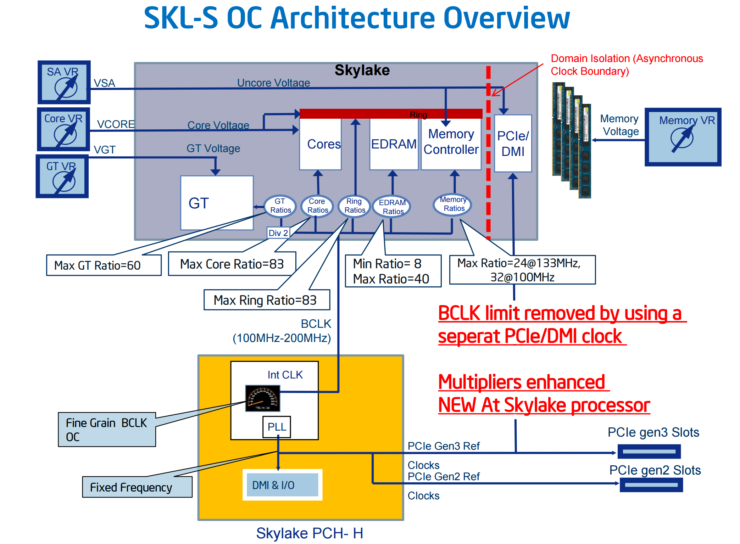 Now you might be wondering what happened to Skylake-S family which were supposed to launch today. Well as you can see, the Skylake-S family includes the rest of the processor lineup apart from the unlocked chips which are specifically part of the Skylake-K family. 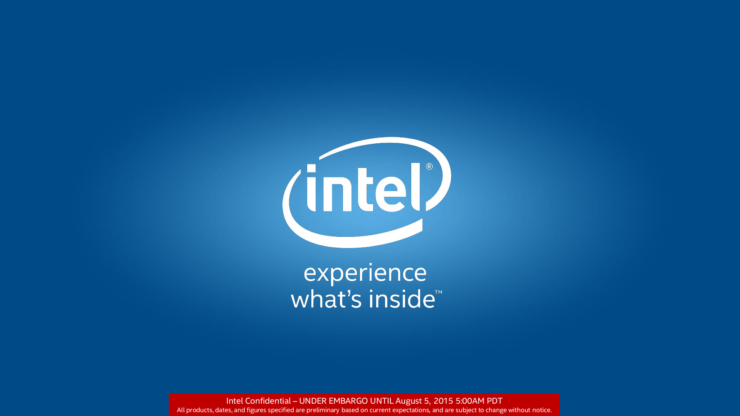 Those processors are going to launch Q3 ’15 or next month. 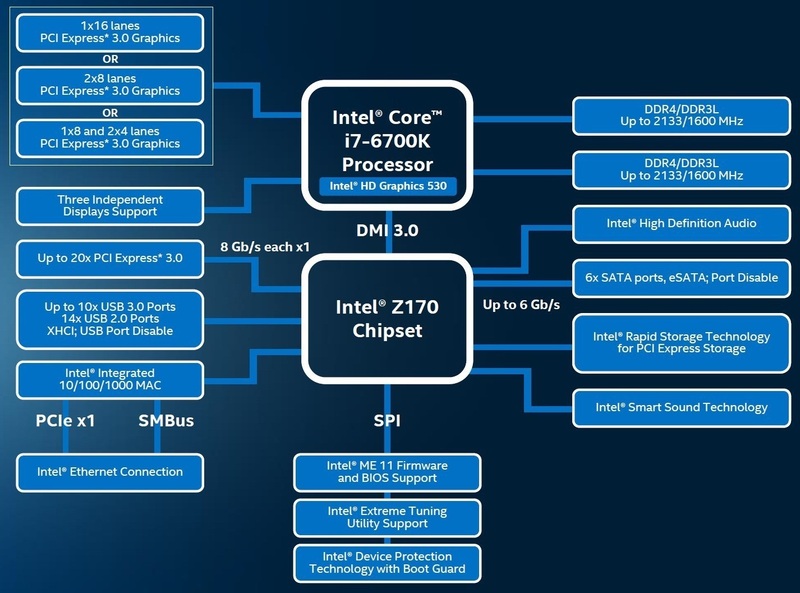 We will hear about these processors in a few days when Intel’s IDF ’15 in San Francisco kicks off. 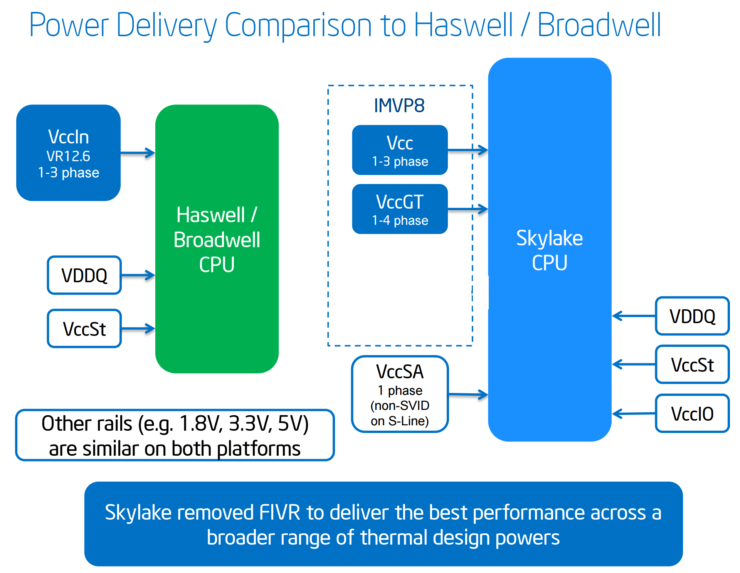 Intel will also present full Skylake architecture disclosures at IDF ’15, detailing the bits and pieces that went in to make the Skylake microarchitecture. 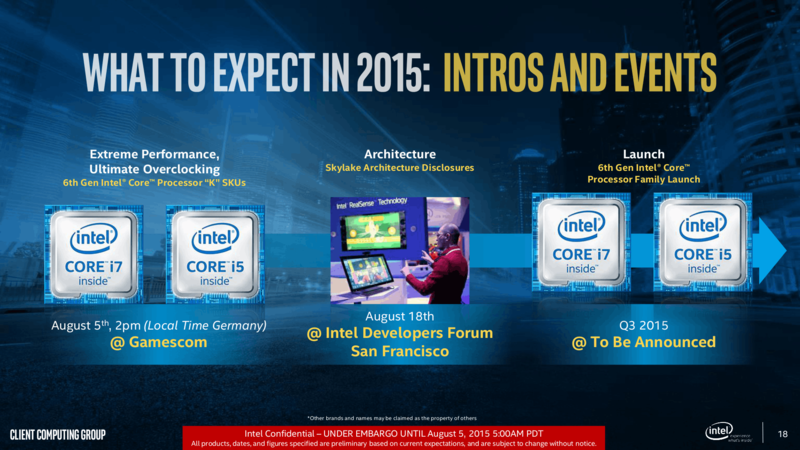 Now let’s come back to Skylake-K, Intel has reached the 6th iteration of Core processor with Skylake. The last ones will be quite obvious to name, starting with the 45nm Nehalem (1st gen), 32nm Sandy Bridge (2nd gen), 22nm Ivy Bridge (3rd gen), 22nm Haswell (4th gen) and 14nm Broadwell (5th gen). Moving onwards and after Skylake, we have Kaby Lake, Cannonlake and Ice Lake but those launch further away so let’s stick to Skylake for now because we know we will get details on them in just a few months as with every Intel CPU generation. 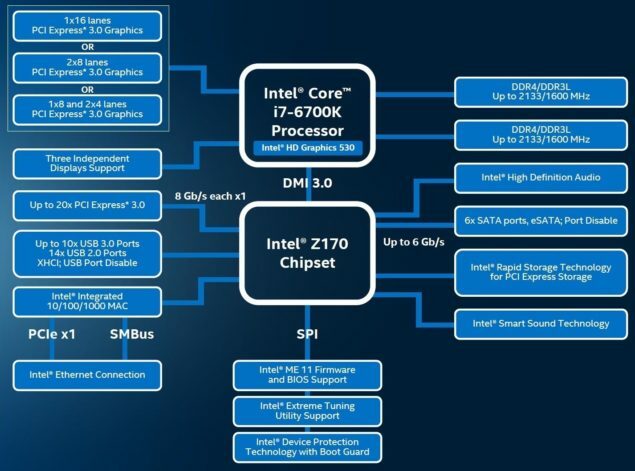 On Skylake, Intel has made significant updates to the microarchitecture which will show their true power with next generation APIs and applications that has been built around these new tools. As we are seeing now, processor performance has reached a bottleneck where a multi-core processors don’t deliver significant benefits and applications more and more rely on single threaded and single core performance. 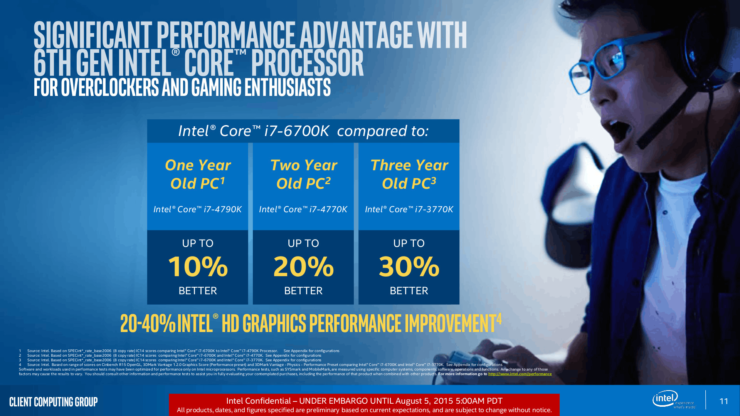 Intel processors have great performance when it comes to single threads but multi-core designs such as the Core i7 and Core i5 don’t get utilized properly and we see slight gains when gaming on discrete graphics cards running a Core i7 and Core i5 processors. It is necessary for software developers and programmers to implement new methods to leverage performance by fully utilizing a piece of silicon whether it be CPU or GPU. 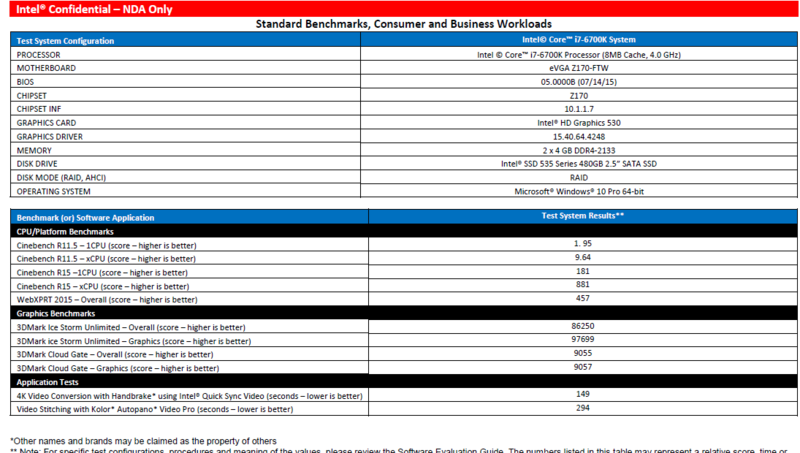 As for the processors, take a look at the specifications below. 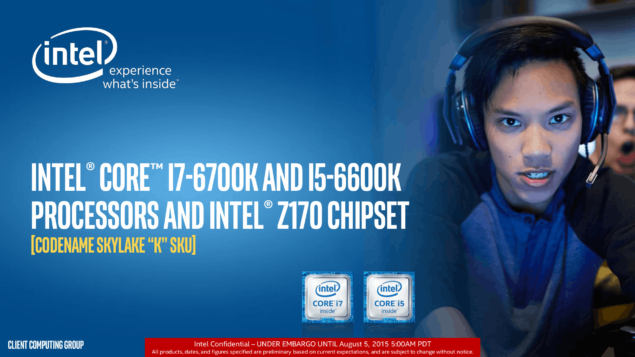 Launching today, the Intel Core i7-6700K is going to be the flagship processor of the Intel Skylake-S family that will initially feature the unlocked processors that include the Core i7-6700K and the Core i5-6600K. The Intel Core i7-6700K is a quad core processor with multi-threading that comes with a base clock speed of 4.0 GHz and boost clock of 4.2 GHz across all four cores. While 200 MHz slower than the Core i7-4790K, the architectural improvements made on Skylake will make up for the frequency difference. 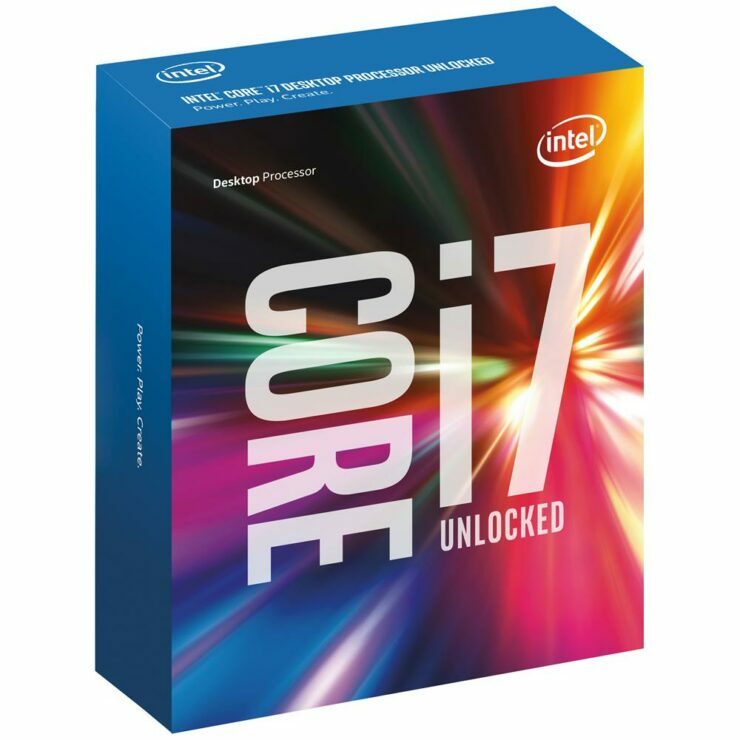 The Intel Core i7-6700K processor comes with 8 MB of L3 cache and supports DDR4-2133 MHz and DDR3L-1600 MHz (Native) while overclocked memory is fully supported since the chip is an unlocked model that is built for overclocking. 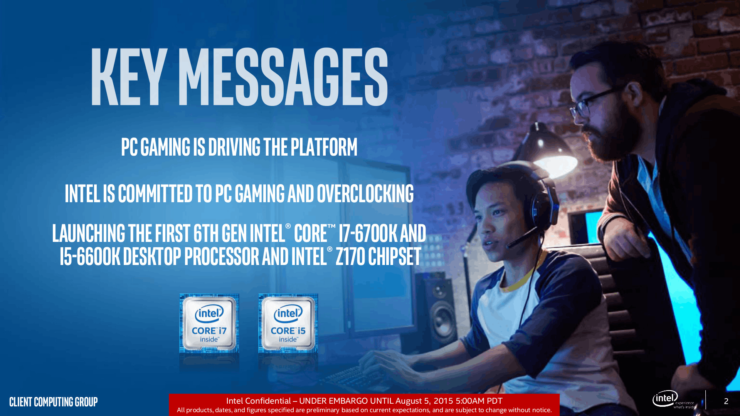 Talking about OC, the Core i7-6700K has the ability to push clock speeds of up to 5.2 GHz on air cooling which will attract several enthusiasts to flock back to overclocking. Other specifications include a HD 530 graphics processor that comes with a base clock of 350 MHz and boost clock of 1150 MHz, fully supporting Microsoft’s DirectX 12 API. The chip comes with a 91W TDP which is higher than Haswell offerings but due to advanced circuitry, the chip reduced current leakage and makes up in terms of efficiency numbers and overall stability while overclocking. 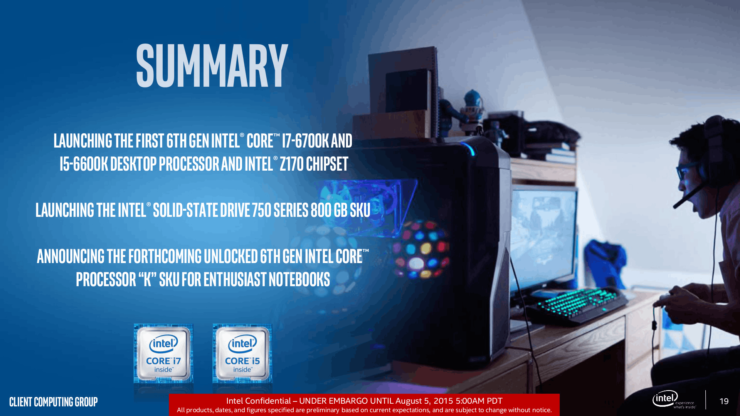 The Intel Core i5-6600K is going to be the second chip of the launch lineup that will feature a quad core design but rids the silicon of multi-threading. 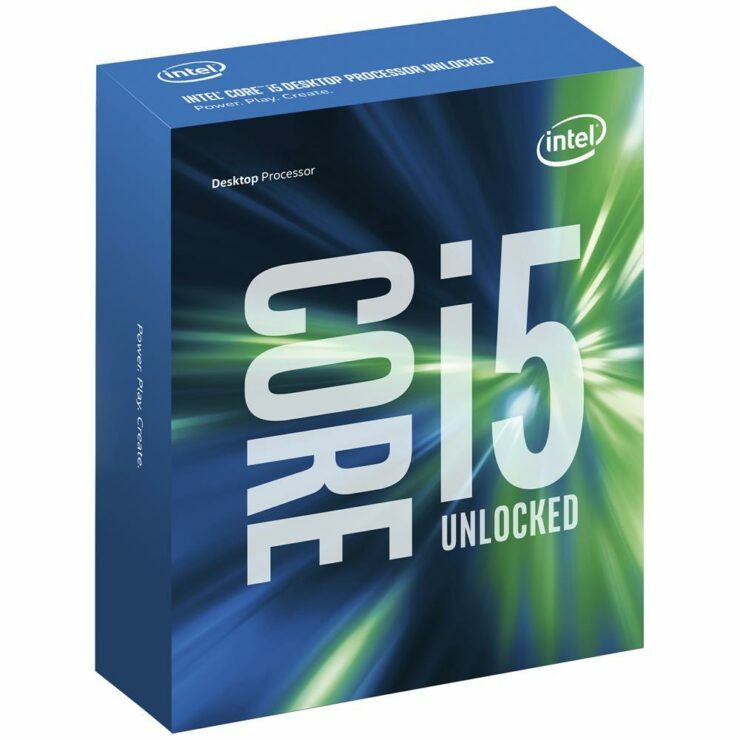 The Core i5-6600K has a core clock of 3.5 GHz and boosts up to 3.9 GHz. 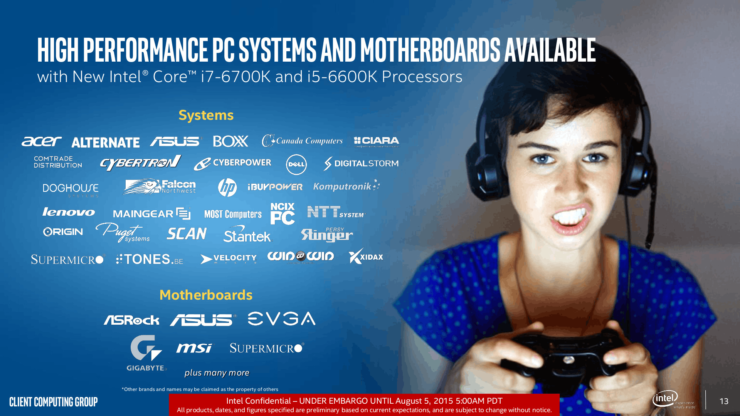 The processors has 6 MB of L3 cache, 16 PCI-Express 3.0 lanes and supports DDR4-2133 MHz and DDR3L-1600 MHz memory. The chip is compatible with the latest LGA 1151 socket that could be found on several Z170 chip based motherboards. The processor also comes with a 91W TDP and features the HD 530 graphics core that has better performance compared to HD 4600 graphics found on Devil’s Canyon. As for the pricing, the chip will retail at $243 US. 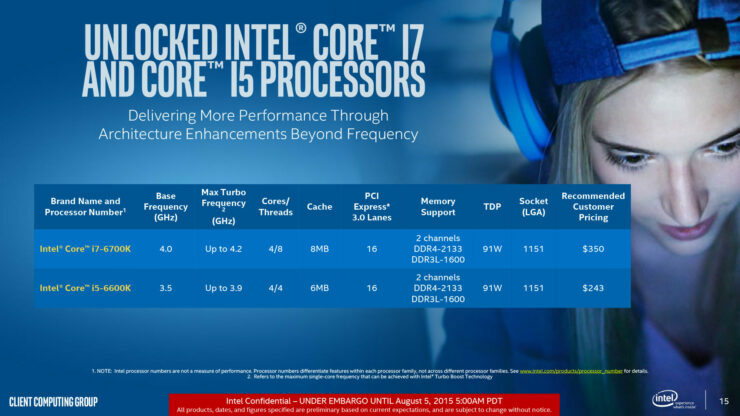 Now the surprising thing is that the chip is both price wise and specifications wise similar to the Core i5-4690K and comparison of these two chips will show a true comparison between the performance improvements of Skylake over Haswell. 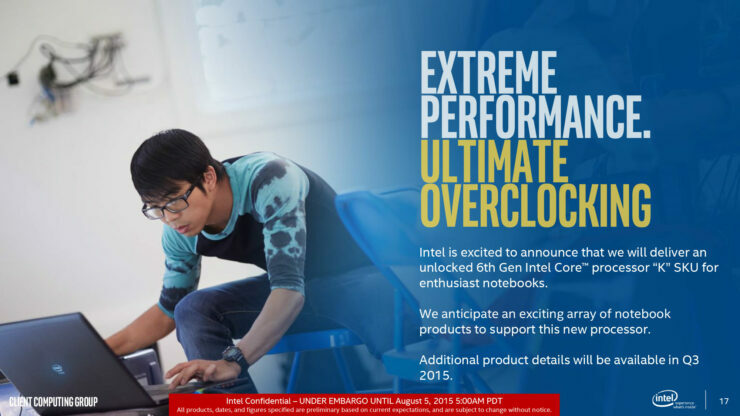 With Skylake, Intel is leveraging their overclock support on their processors. 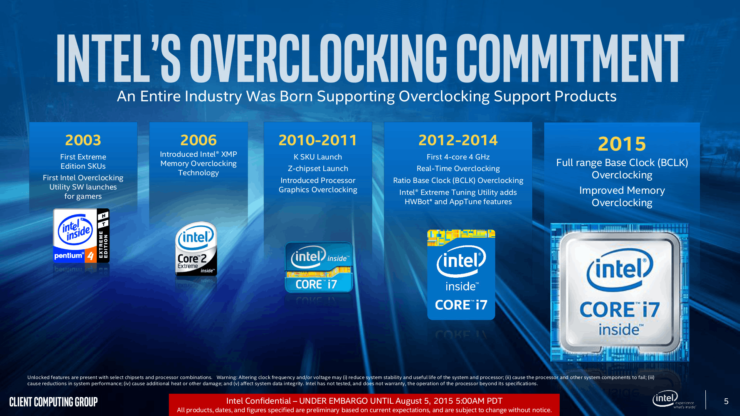 Intel already added significant overclocking features on Haswell with real-time overclocking software, ration base clock overclocking and latest Intel XMP modes with their Intel Extreme Tuining utility. 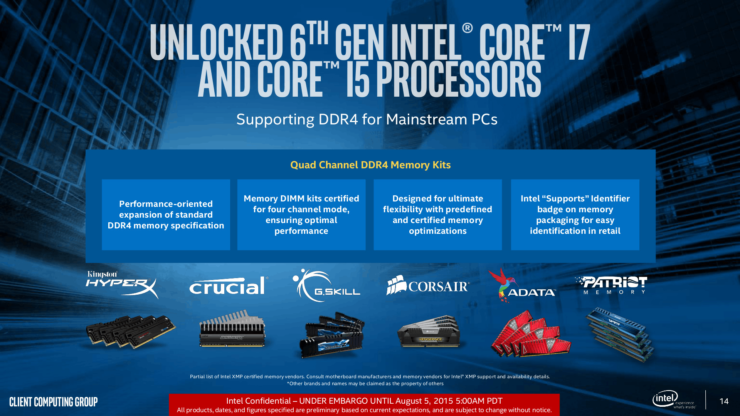 With Skylake, Intel adds full range BCLK tune options and improved DDR4 memory overclocking. With a fully unlocked turbo design that is controllable through software and BIOS, the full BCLK overclocking allows full range, 1 MHz increments over Haswell’s Ration-based tune in 100/125/166 MHz. The Skylake processors also fully support DDR4 overclocking with override capabilities of up to 4133 MT/s and DDR steps tuning in 100/133 MHz compared to 200/266 MHz with finer grain increments. 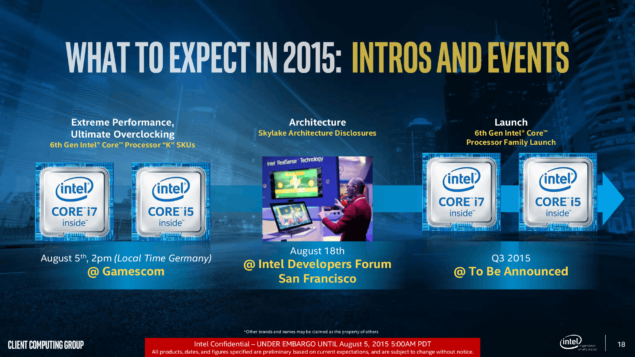 Just the Skylake processors aren’t launching today but a complete new mainstream platform. 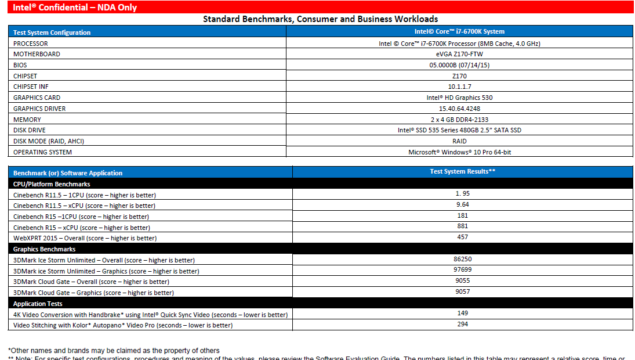 While Skylake adds more CPU performance, the platform itself offers much more features and upgrade options to gamers than ever before. 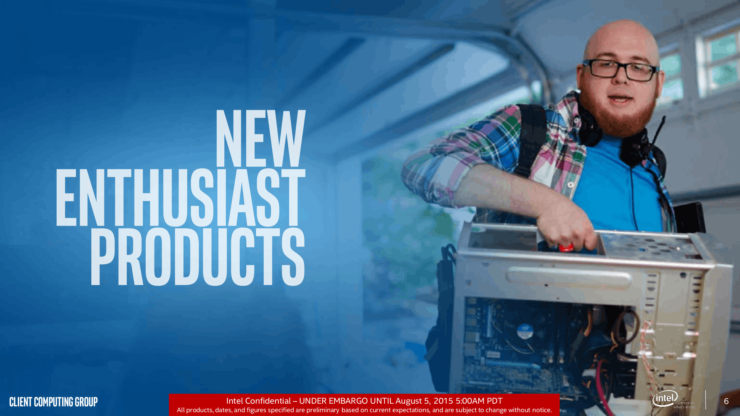 Intel’s Z170 platform features full support for DDR4 memory and also the NVMe Express standard with Intel’s SSD 750 series that have literally shaken the SSD market with blazing fast storage SSDs. 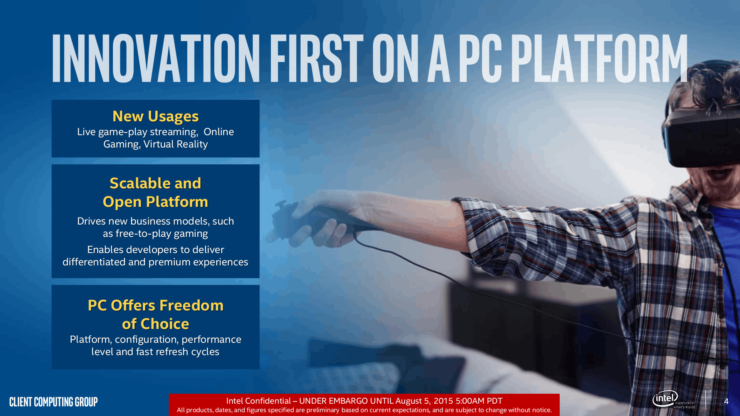 For Skylake, Intel mentions that the platform adds reduced latency, performance that scales with cores, full capabilities for playing on higher resolutions, full performance on NMVe drivers off the Z170 PCH, Intel RST support for PCI-E based storage solutions and new form factors that include M.2 (NGFF) and U.2. Launching today is also a 800 GB SKU in the SSD 750 series which will give users enough room to meet their gaming and even professional needs. 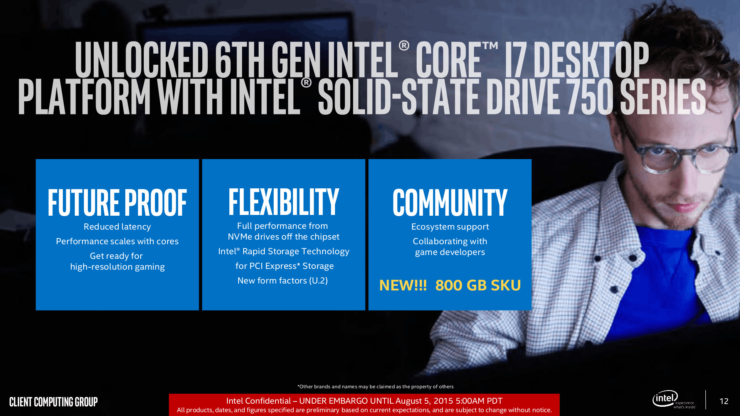 Should You Upgrade To Skylake? 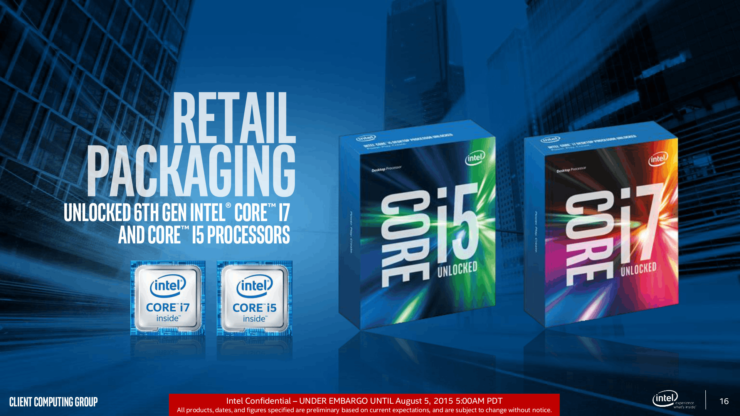 Do fill in the poll below on your expections from Skylake family of processors and whether you are going to purchase one yourself or hold off the upgrade for something better such as Kaby Lake or Zen.